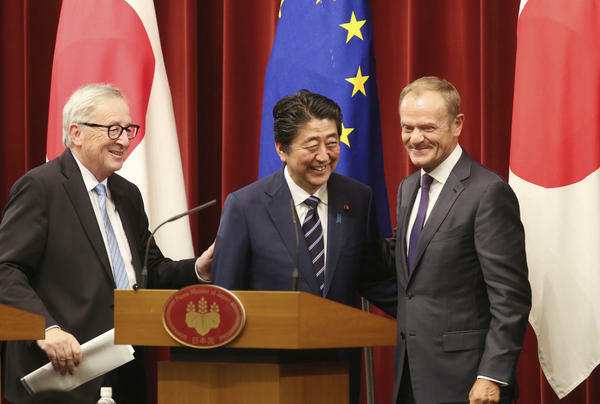 European Commission President Jean-Claude Juncker (from left), Japanese Prime Minister Shinzo Abe and European Council President Donald Tusk conclude their news conference at the Japan-EU summit on Tuesday in Tokyo. Japan and the European Union have signed a massive trade deal that creates an open-trade zone for more than 600 million people. The EU and Japan account for about one-third of GDP worldwide. The deal has been in the works for years, but the parties reached an agreement in principle a year ago, several months after President Trump pulled the United States out of the Trans-Pacific Partnership, a major trade deal with Japan and 10 other nations. At a EU-Japan summit on Tuesday in Tokyo, the envoys were clear that the agreement was intended to send a message about the value of trade and cooperation. "The document we signed today is much more than a trade agreement," said European Commission President Jean-Claude Juncker. "What we're saying is that we believe in open, fair and rules-based trade. What we are saying is that a trade agreement is not a zero-sum game, but a win-win for the involved parties." "Right now, concerns are rising over protectionism all around the world," Japanese Prime Minister Shinzo Abe was quoted as saying by The Japan Times. "We are sending out a message emphasizing the importance of a trade system based on free and fair rules." The trade deal is set to eliminate the "vast majority" of the $1.1 billion in duties that EU companies pay to Japan, according to the European Commission. The deal removes "about 99 percent of the tariffs on Japanese goods sold to the EU," according to The Associated Press. "About 94 percent of the tariffs on European exports to Japan will be lifted, rising to 99 percent in the future." As The Economist has noted, at its most basic level, it is "a deal easing the flow of cheese in one direction and cars in the other." "The deal removes EU tariffs of 10 percent on Japanese cars and 3 percent on most car parts," according to Reuters. "It would also scrap Japanese duties of some 30 percent or more on EU cheese and 15 percent on wines, and secure access to large public tenders in Japan." The EU agricultural sector appears poised to benefit. And according to the Japan Times, some farmers in Japan are worried that an influx of European food products might impact them negatively. The agreement stands in sharp contrast to trade developments in the U.S., where the Trump administration has pushed forward with an array of tariffs on several nations. Most recently, the U.S. announced plans to impose $200 billion in new tariffs on Chinese imports, leading China to file a case with the World Trade Organization this week. Other U.S. tariffs on aluminum and steel have upset trade partners Canada, Mexico and the EU. The European Union hailed the trade deal with Japan as the largest it has ever negotiated. "We are sending a strong signal to the world that two of its biggest economies still believe in open trade, opposing both unilateralism and protectionism," said EU Commissioner for Trade Cecilia Malmström. The agreement still needs to be approved by the respective parliaments, with the hope that it could come into force in 2019. It was originally set to be signed earlier this month, but Abe rescheduled the ceremony because of deadly floods in western Japan.